The workday at the Armory and Park went pretty good last Saturday despite the bitter cold wind. The winds ran most of the work inside the Armory and it was just as well because it sure needed it! The new cook top was installed in the old Lions Club kitchen thanks to the skills of Harold Fharlander, Curtis Fellers, and Ron Reece. My little buddy Rob Cheaney and I got stuck with dumpster duty... I think that may have been the only thing we were qualified for! But they really shouldn't put us sentimental guys in charge of throwing stuff away... Out of four pickup loads destined for the dumpter... mostly old Lions' "stuff", I took home one load and I am not sure what all Rob had! There were twelve of us that showed up and enough work for twenty more... and it's one of those deals where you never get finished... so watch for another clean up! I hope next time Rob and I get something a little more glorious like sweeping or mopping! Gary James, a name most of us have heard. I did not know Gary, but I am sure that some of you may have. The city park is named in his memory and the old armory and now Community Center has a beautiful wood memorial shadow box in his honor just inside the front door. 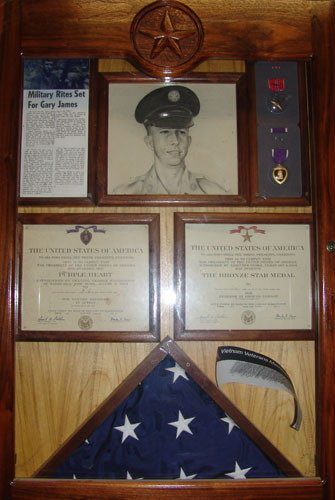 A hero, Private First Class Gary James, was killed in action while serving in the United States Army in Vietnam. He received a Bronze Star for "Heroism in Ground Combat" and a Purple Heart for "Wounds Recieved in Action". The body of Pfc. Gary Lynn James, 23, who died recently in Vietnam, will arrive in Santa Anna tonight,(Thursday), and funeral services will be held will be held there Friday afternoon, June 9 at 4:00 p.m. at the First Baptist Church, with the pastor, Rev, Bill Brewer, officiating. Interment will be in the Santa Anna Cemetery. Hosh Funeral Home is in charge of funeral arrangements and the body will lie in state there until time for the funeral. The young soldier will be buried with full military honors, and an honor guard from Fort Hood will be present for the ceremony. Pfc. James was born Aug. 5, 1943 in Santa Anna He died May 28, 1967 in Vietnam from mortar fragment injuries suffered May 21st while serving as the "point man" for a "search and destroy" mission. 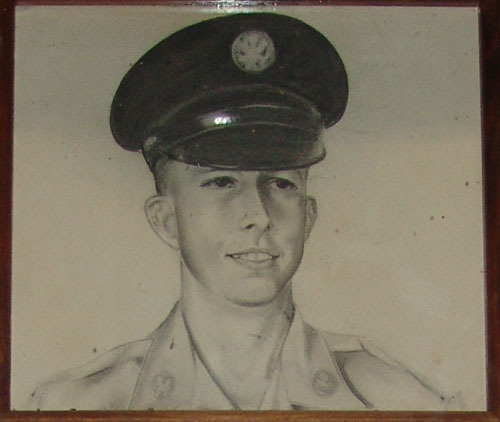 Gary entered the Army in June 1966, after unsuccesfully attempting to enlist over a two year period. He was a slight-built boy and just did not weigh enough. The night before he went for his succesful physical examination, he ate all night and gained three pounds, which was enough to get him in hte service. He was sent to El Paso for basic training, and then, because of his small size was chosen and trained as a "tunnel rat". This is the dangerous job of going into tunnels and clearing them of mines and enemy soldiers. Gary was a tunnel rat during the clearing of the "Iron Triangle". In Paril he was appointed point man with "search and destroy missions". Shortly thereafter he received the Purple Heart following a shrapnel wound in the leg. He had been back in combat less than three weeks when he recieved fatal mortar wounds during the biggest battle of the Vietnam conflict. Gary was proud to serve his country. He often wrote home thate he wished people here could come over and see conditions there. He wrote, "if they did, they would fight their hearts out to keep it from coming to the USA." In honor of the deceased soldier, flags will be flown at half mast all day Friday. 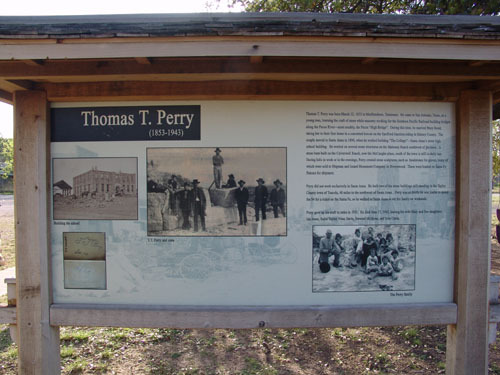 Survivors include the mother, Mrs Madie James of Santa Anna; the father, I. O. James of Coleman, two sisters, Mrs. Bruce Cammack of Santa Anna and Mrs. Curtis Alvey of San Angelo; a paternal grandfather, Jim Owen of Santa Anna, a number of uncles and aunts in this area and two nephews and one niece. Gary is buried in the Santa Anna Cemetery in Platt II Block 76 which is just South of the tool shed. His headstone is a beautiful light rose colored and marbled granite stone with a traditional bronze military grave marker. 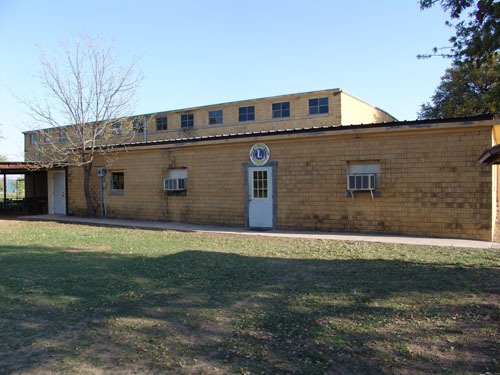 Of course the Armory itself is a historical place with the training of soldiers, the Lions Club, current home of Funtier Days and World Championship Bison Cook-off, and most recently the T. T. Perry historical memorial. The Armory, park, and baseball fields are really important parts of our town. Not too many towns still have an old armory that the public can use. A lot of work has been done to make them the way they are but it takes a lot more to keep them up. The baseball group will be meeting this Saturday morning bright and early at 8:00 to do some more work on the fields. At 9:00 the Armory and park will start their community workday (See below for more details). Why not get started early and have a fun day with friends, family, and neighbors. I also read in the Coleman paper that there will be a Fire Department benefit fund raiser at Double H Sunday... I think it was Mexican food on the menu at $7 per plate. Santa Anna - "More than just a mountain"
On Saturday, March 28, 2009, the Park and Armory Committee will have a community wide work-day/clean-up at the City Park and Community Center at 9:00 a.m. The newly reorganized operation of the park and armory has included developing a plan to refurbish this invaluable community treasure. 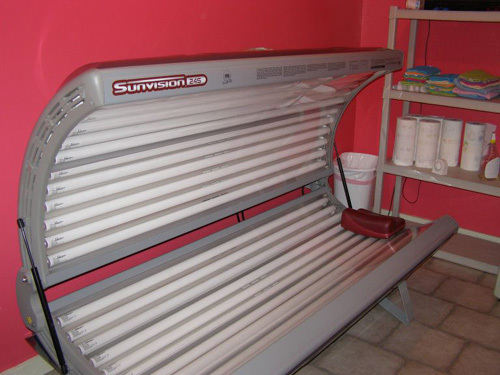 One aspect of the plan is giving the entire facility a thorough cleaning and polishing. Anyone who is able and willing to work is invited to come the last Saturday in March to help renovate this historic treasure. In addition, if you wish to make a monetary contribution to the project, you may bring the gift that day. 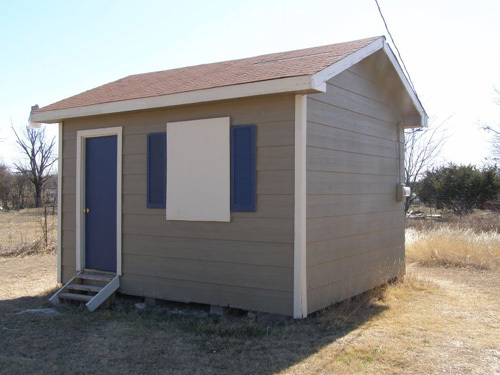 WHEN: Saturday, March 28, 2009, 9:00 a.m.
WHO: Any and all citizens interested in making our Community Center and Park a better, more attractive, more desirable facility for our town. The Santa Anna One Act Play, pictured below, performed in Zone competition Wednesday held at the Santa Anna High School Auditorium. 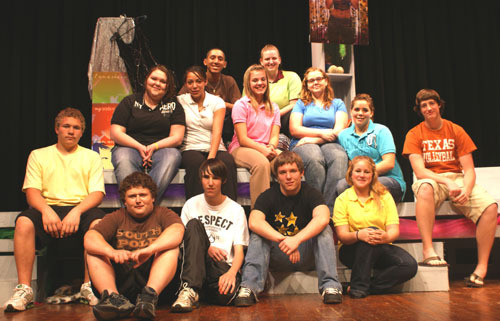 The play advanced to District competition to be held at Santa Anna High School next Wednesday, April 1st, 2009. I forgot to tell you about my rain this week. I poured out almost a half inch from two days. The trees are all blooming now and the wild flowers are coming out. Lots of little babies running around too. Tex Wright reports. "Just over .2 at the Wright Place Wednesday after noon, some very small hail. This morning we had about 2 inches of fog at the back door. Couldn't hardly open the screen door. Dink was a small man with a big heart. Around five feet tall, he seemed like John Wayne wearing his cowboy hat but was probably more like Little George Havens. Dink could have been in the movies too, but he wasn't. Instead he grew up in a day when riding a horse was the more common way to travel. He broke horses when he was younger out in the Echo and Burkett areas. He was a tough man too, he had to be. 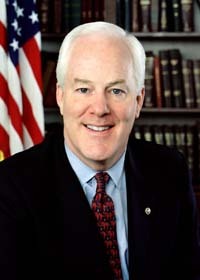 He would tell some tall tales of the good old days in a frontier Santa Anna and Coleman County. When I was in the Mobil station Dink would come by every morning and afternoon to stop and visit before going to Phillip's Drug for coffee. Some days he would drink too much and rub his little round belly on the way home. He used to make fun of me not having a belly... oh, for those days again! For a while he road a three wheeled bicycle.. I guess that would be a tricycle, and then he walked from his home a couple of blocks away on North Santa Fe and then would sit out front on one of the old school bus seats in the morning, resting while he waited on David and Carolyn Barley to open up. Back then the Barkleys parked on the side of what is now Patterson's Coleman County Woodshop and between the cabinet shop and the Mobil station. Dink would always check his watch and holler out if they were late. I remember once I got some new bus seats from Lee Ray Huggins. Lee Ray was taking care of the buses back then and the school got a new one for the football team and the first thing he would do was bring it by for me to take the two back seats out so they could load football equipment in the back. I don't think Dink liked the new seats. He had a hole worn in the old seat and I guess it fit him like one of those old saddles. I moved it back out in front until he was gone and then it just didn't seem right for anyone else to sit there. Go see an old friend today because tommorrow may be too late. I was out at the Santa Anna Cemetery Sunday afternoon easing down one of the roads looking and not paying much attention... as I backed up to take a look at a fallen stone, I saw a red and white Ford pickup coming down the road behind me. I didn't recognize it or the cowboy driving it. It was still a pretty good ways behind me... not close enough to make out anything other than the black cowboy hat. Not even on the same road as me but pulled in behind me so I eased forward, made a block, and stopped where I needed to start. I was in Platt IV of the cemetery, sometimes called the Odd Fellows section, and the Ford pickup truck eased on down to Platt V... the new part of the cemetery below the hill. As I told you maybe, I have been taking pictures to catalog the monuments and record their condition before we start restoring some. I continued taking pictures starting and finishing section one of Platt IV and on to section two of Platt IV... a good hour or so later, when I noticed the pickup truck heading back towards me and then on around the North side of the cemetery around Platt III. I noticed the cowboy stop, get in, and out a couple of times. Then he came back down the road behind me. Out of the truck stepped out an old friend and former employee. It was Jason Miller, step-son of Steve Cullins, of Santa Anna National Bank fame, and son of Marilyn, who worked at the school for many years. It has been over a year since I have seen Jason and his wife... in fact at Cynthia Garrett Philpot's funeral. Jason had come to visit Cynthia. Now here is the funny part, if there is one. For years, Jason worked for Cindy and I at both the Mobil and Exxon service stations. All that time I drove the old Ford pickup that I bought from O. D. Warnock that I mentioned in the News a couple of weeks ago. Well Jason was a Chevy man and he constantly made fun of me driving a Ford! I remember when he first went to work for us he backed into my old Ford's driver side door and put a foot long dent in it. He thought I was going to be real mad at him but I just told him that he could work it out and not to worry because it matched the door on the other side... and he did work it out for about five more years I think. There was never any money, or labor exchanged but Jason made up for it by being one of the best hands I ever had and that was enough for me. Then there is the hat... and the holey jeans. He always wore a cowboy hat even though I never knew of him riding a horse... or a cow for that matter. The holey jeans were either the only ones he had clean or the most comfortable he had. He had to tell me, " I wore my good jeans on Saturday and got them all dirty over at Paul's house." Jason and Paul Bryan have been friends for many years... working on cars and trucks battling between Dodges and Chevy's... and I guess Fords now too! We had a good visit and got to talking about people we knew and J. T. Avants came up in the conversation. Jason always liked J. T.'s old white Ford pickup truck... it had a stick shift, big diggers on the back, dual exhaust, and a bonus was the big block engine... but then it was a Ford. J. T. always had a liking for Jason... he would get that twinkle in his eye when he talked about Jason... now that I think about it, the same twinkle he got in his eye when he talked about me. "Jamesy" he always called me. 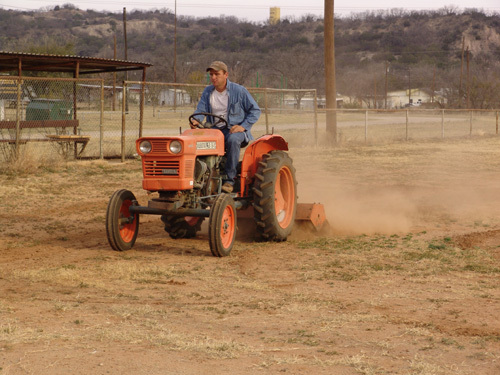 I sure miss that old man... he was one of those "John Deere men" I have told you about before. Those that road an old John Deere tractor before they had cushioned seats, radios, and air conditioning... until their bodies wore out. I told Jason, "There are folks we know all over the place out here.."
I had already seen several of them that Sunday afternoon. There was Tom Hays, Mr. Balke, Mike Hosch, Ford Barnes, Claude and Opal Langford, Thelma Upchurch, Lori Herring-Huffman, and many others I had already seen that day. There was another special one to me that I had seen and that was Dink Payne... I want to tell you more about old Dink but it wall have to wait. I just can't right now... maybe Wednesday. Thanks for listening, thanks for coming by SantaAnnaNews.com, and as always come back soon! Jessica said I had more rain in the gauges... looks like another three quarters of an inch. 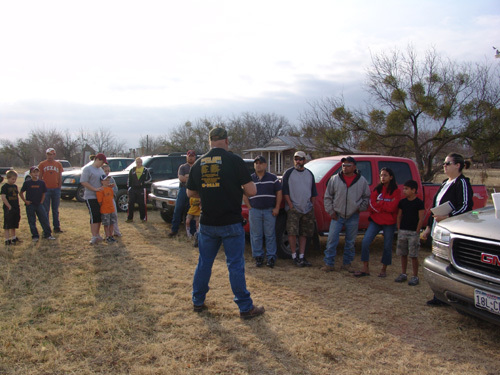 Santa Anna Community Services had their meeting and workday last Saturday at the baseball fields. In the short meeting President of the group, Tim Perry, discussed the possibility of changing the name of the group. No change was made to the name with a decision to be made at a later time. There was a good turnout for the early Saturday morning workday. I had about two inches of rain in my gauges. Tex Wright reported Wednesday, "Seems like we usta' call it rain or something like that. Here at the foot of the beautiful Santa Anna Peaks, we had .48 in our rain gauge. I hope you had more. and Thursday "I checked the gauge about 7:45 this morning and found another 1.50 inches. Together with the .48 yesterday morning, it gives us 1.98 inches for the duration in Beautiful Downtown Santa Anna. Sure is appreciated. Thank You Lord. 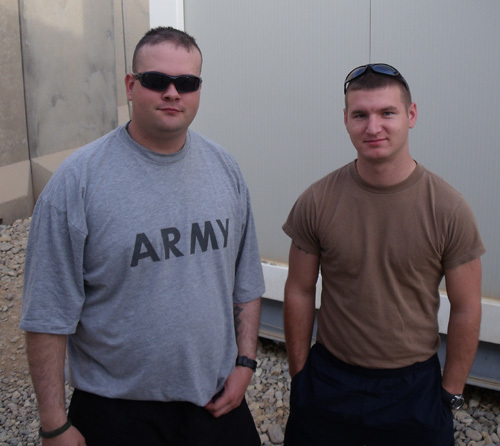 I told you that I have exchanged several e-mails with Eddie Dawson over in Iraq... and also Thomas (aka Brandon) Beloat. "Hey Mr. Pelton, I know that Eddie has been talking to you lately but I found someone over here that was at my surprise... Michael Ruth. I was walking back from the PX and he stepped around the bus as he got off. That's when we saw each other... so I already have a pic on the way. I had a friend take it for me cause I didn't have my camera there with me so when I get the pic I will send it to you." I love how he calls me Mr. Pelton... it makes me feel old though! But you know Brandon was brought up right and that is something we don't see too much anymore. It is a pretty good bet that anyone brought up around his Grandmother, Thelma Brooker is going to be brought up right and know how to say yes sir, no sir, yes ma'am. and no ma'am! Well he got me that picture and here they are... Brandon in the Hollywood shades and Airman Michael Ruth, serving with Patrol Squadron NINE (VP9) from Kaneohe Marine Corps Base Hawaii. 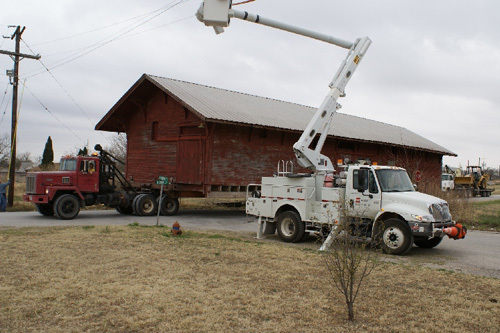 The Santa Anna Economic Development Corporation recently purchased the old Santa Fe Railroad depot to be moved back into town as a Museum and Visitor's Center. The depot will be relocated to Wallis Avenue where the City's covered parking used to be next to Cool Creek Outfitters (The old WTU building). Pictured in the photos submitted by Tex Wright below is AEP West Texas personnel assisting in the move on North Santa Fe on Tuesday. 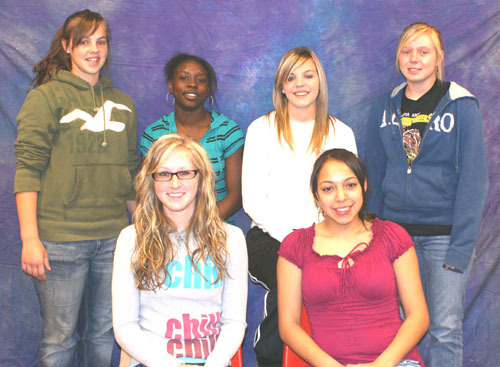 The Santa Anna High School District 14 A UIL Cross-Examination Debate team of Caylie Robinett and Adelaida Dean will be competing at the state meet on March 15 through March 17, 2009 in Austin. They won first place at the District meet. 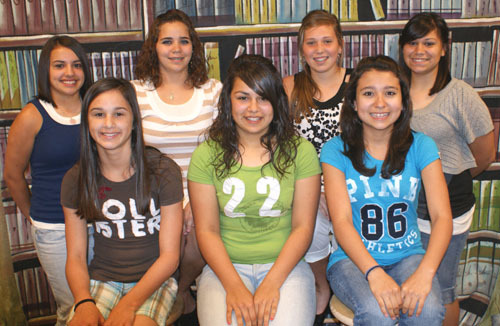 The girls will be making a return trip to the state meet from last year, where they advanced to the Octo-finals. 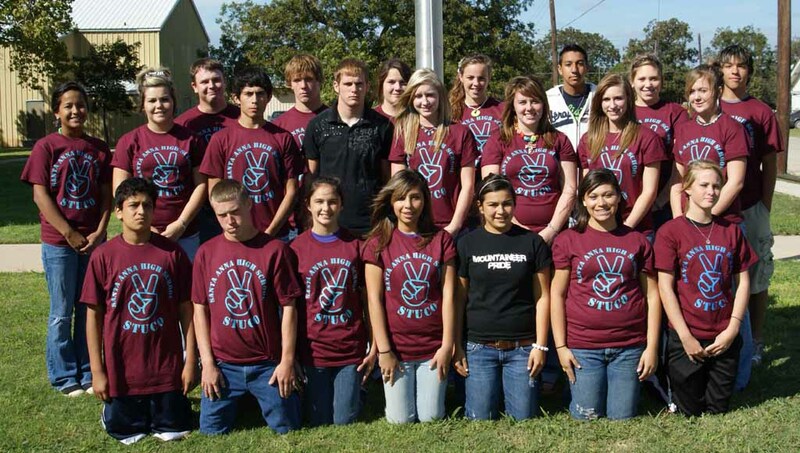 This qualifies the team to apply for a UIL scholarship in May. 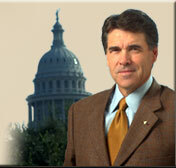 The topic for this year is concerning the Federal Government giving incentives for alternative fuels. The timely topic has given the teams across the nation to research alternative energy sources and how they might be used in future. The team of Shawn Robertson and Dillan Whitely from Santa Anna High School earned the alternate place to the state meet by placing third at the District contest. It is the second year for the boys to debate. The students and faculty at Santa Anna Elementary celebrated their principal’s birthday on Friday, March 6th. Mrs. Debbie Bacon turns fifty on Saturday, March 7th. 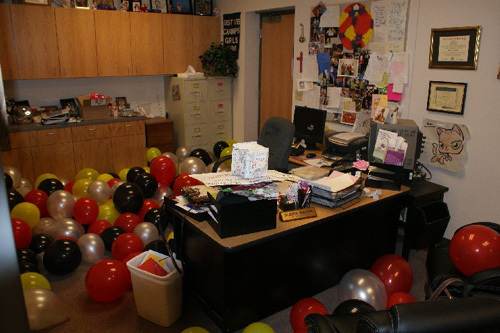 The halls, classrooms and Mrs. Bacon’s office were decorated with posters, cards and balloons. Happy Birthday Mrs. Bacon. We love you. 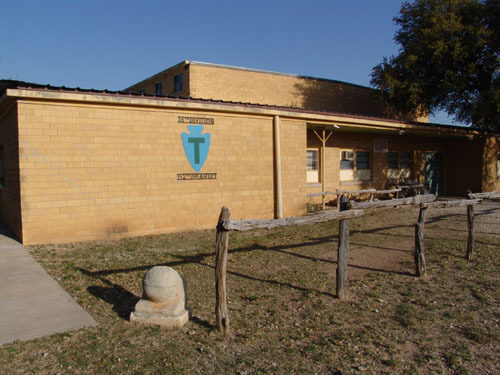 Below is a picture of Debbie Bacon's office as Principal of Santa Anna Elementary School. Ms. Bacon is being helped by all students, Teachers, and other members of the administration in celebrating her 50th birthday. The school building is decked out in black balloons. Many of the teachers and others are wearing black in memory of her youth. Ms. Bacon is a much appreciated part of the Santa Anna School System, appreciated by the whole community for her efforts in education. I could not locate Ms. Bacon to pose for the picture, I think she was hiding. Happy Birthday Mrs. Bacon from SantaAnnaNews.com! Do you know who Mary E. Ashley was? Maybe she was a relative of yours... I dare say if she was, that you never knew her. Of course, it is not easy to be historic in your own time and Mary Ashley has been gone for a long time. Most would think that she did not have a life of historic importance. To me she has become more so historic on a personal level over the last several weeks as I have begun photographing each monument at the Santa Anna Cemetery. That is the reason I am going to re-visit the Santa Anna Cemetery for part IV of this series and introduce you to Mary E. Ashley. Mary E. Ashley was more than likely not the first person buried in the Santa Anna Cemetery but I would bet that she probably knew that person for you see, Mary Ashley was one of the first people buried in the cemetery that still has a monument. It probably is not the first monument either, for some of them appear to be older than her's. Her monument reads, "Mary E. Ashley, Born Nov. 15, 1869 Died Mar. 7, 1885." Just fifteen years old. It must have been very sad for her family I am sure, but there are several Ashleys buried near young Mary. There is Darrell D. Ashley, and a place for his wife Ruth E Ashley. There is also M. C. Ashley a Confederate soldier in Company C of the 29th Texas Cavalry. Hannah Ashley, who I think may be Mary's mother, is also there close by. All of them in Block 28 of Platt I which is due East of the Tool shed at the Cemetery. 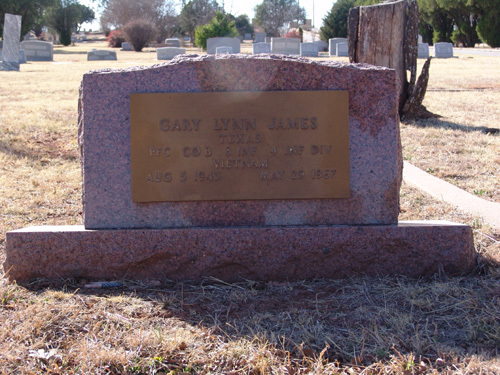 The first place to go when locating graves in the Santa Anna Cemetery of course is Vena Bob Gates, Judia and Ralph Terry's Volume 3 of their three volume "Coleman County Cemetery Inscriptions", as well as other Coleman County cemeteries. 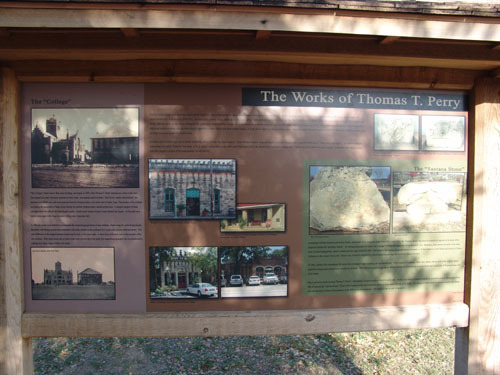 A long time Coleman County historian, Ralph Terry has done extensive research for his books and his Coleman County History website and particularly the Santa Anna Cemetery pages are useful when locating graves in our Cemetery. According to Ralph, Ruth's maiden name was Huggins so maybe she was a relative of my old friend David Huggins or his father and my mentor the late Lee Ray Huggins. Ralph also indicates that Hannah's name was Wood. Whatever you decide about young Mary E. Ashley, I hope that you will find her as historic as I have. A planning meeting will be held at Heritage Hall beginning at 7:00Pm on Thursday March 5th. We will have a very short business meeting before we begin to plot the next two years' programs. 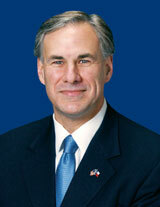 If you have ideas for any programs of interest to Coleman County, we would welcome your input. 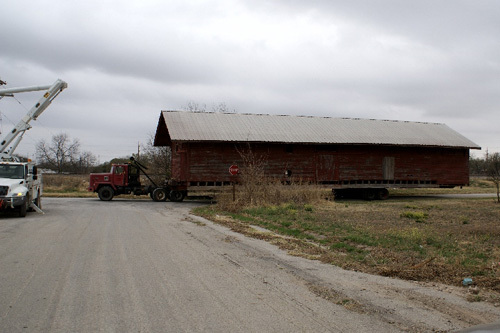 Stories and histories of the farms and ranches that have been in operation by one family for over 100 years. A complete history of the Coleman Airport including the training school. And the best idea of all is the one you just thought of. Bring it to the gathering for discussion. There are many other ideas that you have thought of that has not come to the mind of the CCHC board. We would like to hear from you. If you can not, for some reason, attend this meeting, send your ideas to colemanchc@gmail.com and to follow up on this or offer after the fact comments go to www.cocohico.webs.com , the new web site for the CCHC. 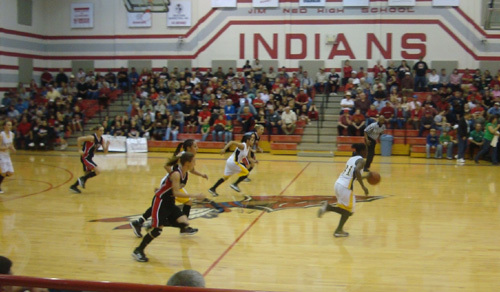 In a regional quarterfinal game pitting the state’s number one ranked team, the Roby Lady Lions against Santa Anna, Roby was able to extend their quest for another state championship appearance with a 62-46 victory. 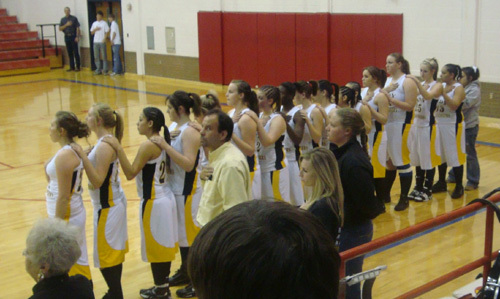 Playoff jitters is probably the best description of the Lady Mountaineers poor start. Roby jumped out to an early 7-0 lead only to see Santa Anna fight back to a 10-7 deficit at the end of the quarter. 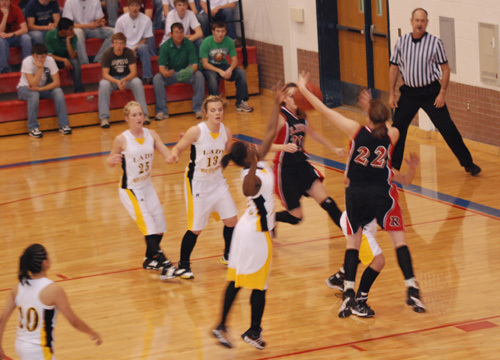 The second quarter was devastating for the Lady Mountaineers as Roby went on a 23-12 run. Santa Anna scored four three-point shots but Roby connected on seven of eight free-throws in addition to 16 points from the field that resulted in a major difference towards the outcome of this quarter. Santa Anna was outscored 13-9 in the third quarter and by this time Roby had an almost insurmountable lead of 18 points. Santa Anna was able to outscore Roby by two points in the fourth quarter but it was too little, too late. 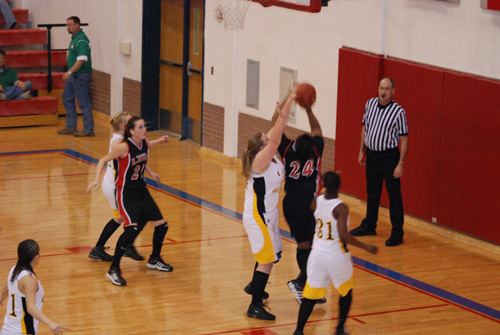 This game marked the end of the one most successful season’s in the history of Santa Anna girl’s basketball. Alumni have reported that it has been over 35 years since Santa Anna has advanced this far and it was in three-on-three that they had fared so well in. 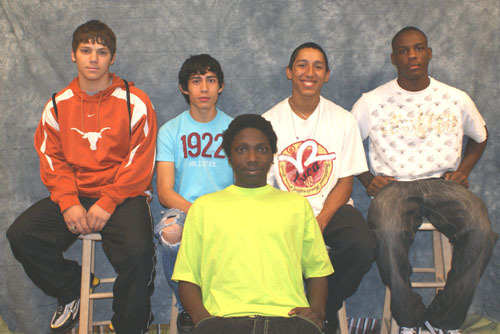 Since the change to full court basketball, Santa Anna has made the playoffs but not won an area championship. Santa Anna finishes the season with a sparkling 26-5 record, 15-1 district record, and Division II Area champs as well as Regional Quarterfinalists. Congratulations to Coach Libby and the Lady Mountaineers on their season! We will be having a brief meeting at 8:00 sharp to discuss/vote on a change in name of Santa Anna Community Services. All volunteers willing to help get our community softball/baseball fields in good playing condition for this coming season are encouraged to come! Anyone who no longer has any use for softball/baseball equipment, apparel or cleats in good condition are asked to please drop off at the fields on this workday. We are always appreciative of any support! 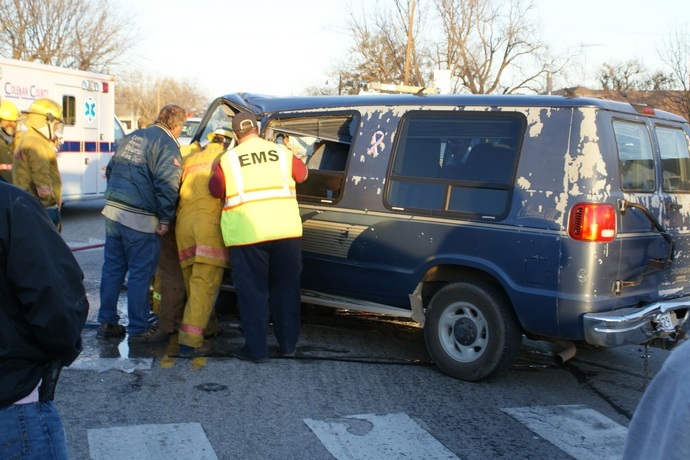 There was an accident that took place around 6:00PM Saturday February 2008 at the intersection of US84/67 and US283 in Santa Anna. 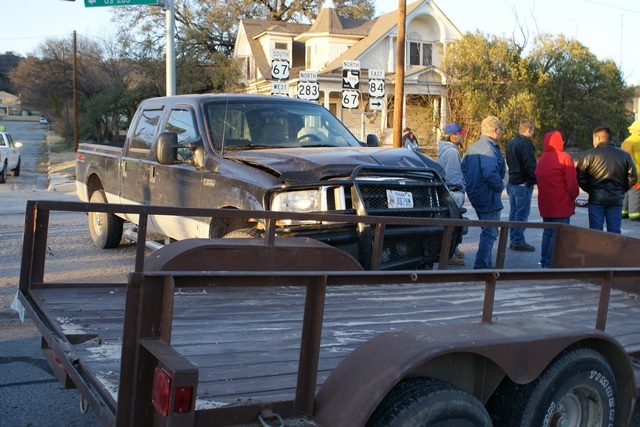 The pickup truck inv loved in the accident was believed to be that of Randy Brown of Santa Anna. 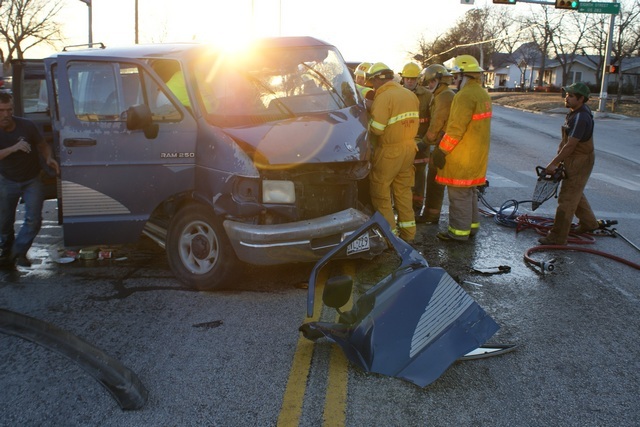 Members of the Santa Anna Volunteer Fire Department are shown using the Jaws of Life to extract the driver of the van. Photos submitted by Tex Wright. 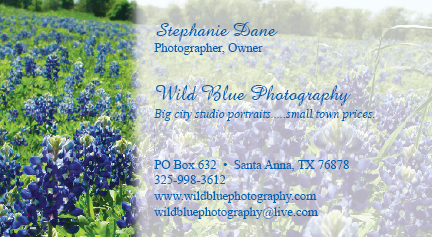 The Santa Anna Economic Development Corporation has a new web site. You can check out the site by going to santaannaedc.org. The board decided that in this day and time, a web site is certainly an essential tool for bringing necessary recognition to a community. This site has ten categories to choose from, ranging from news, monthly business profile to local opportunities. A page of church listings with photos, as well as a page dedicated to organizations has been included. If folks have an event coming up, they can always have it mentioned in the calendar of events. If you or anyone you know has a bit of organization or business news that you would like to have included in the web site, you may contact Judy Meister by emailing to fraudog@web-access.net or by calling 325-348-3134.